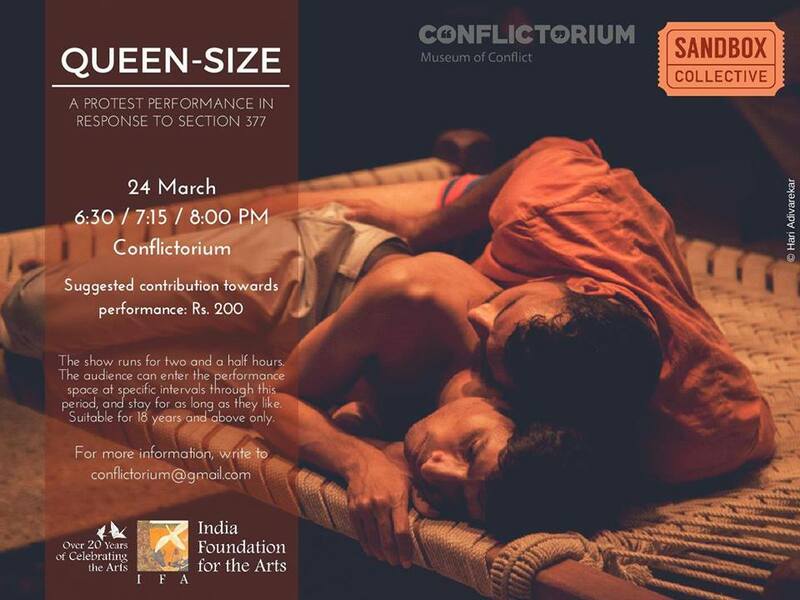 Conflictorium is delighted to host ‘Queen Size’ again as part of Performance Quarterly! The performance is durational and runs in a loop of two and a half hours. The audience can enter any time and stay for as long as they like. As a response to section 377 of the Indian Penal Code that criminalises homosexuality in India, Queen-size is a choreographic exploration that takes the form of a detailed study of the intimacy between two men. Played out on a charpoy, the duet examines the nuts and bolts – carnal, mechanical and emotional – of a close encounter between two male bodies. In deliberately making this encounter visible, Queen-size poses questions around spectatorship, privacy and dissent. The work has been triggered by Nishit Saran’s article titled ‘Why My Bedroom Habits Are Your Business’. Mandeep Raikhy is a dancer and choreographer based out of New Delhi. He pursued his BA (Hons) in Dance Theatre at Laban, London, and worked with Shobana Jeyasingh Dance Company for several years. He has created 3 full-length works, Inhabited Geometry (2010) and a male ant has straight antennae (2013) and Queen-size (2016) and divides his time being creating and touring his artistic work and being a dance administrator. Sandbox Collective is a creative services organisation that curates, produces and tours performances. It acts as a catalyst facilitating meaningful collaborations nationally and internationally between artists, cultural agencies and arts spaces creating an explosion of innovative artistic expression.